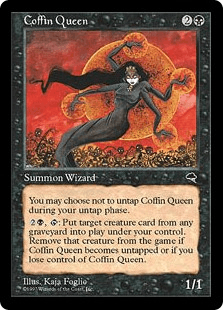 You may choose not to untap Coffin Queen during your untap phase. , : Put target creature card from any graveyard into play under your control. Remove that creature from the game if Coffin Queen becomes untapped or if you lose control of Coffin Queen.